Wood accent walls have been popular for a long time because of the warmth and texture they add to a room, infusing it with a rustic cabin vibe. 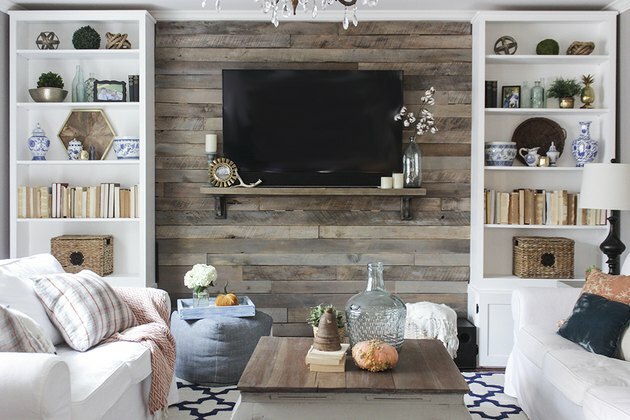 Because pallets can be found or obtained for little-to-no cost, they can be an inexpensive option to completely transform the look and feel of a room, in just an afternoon. 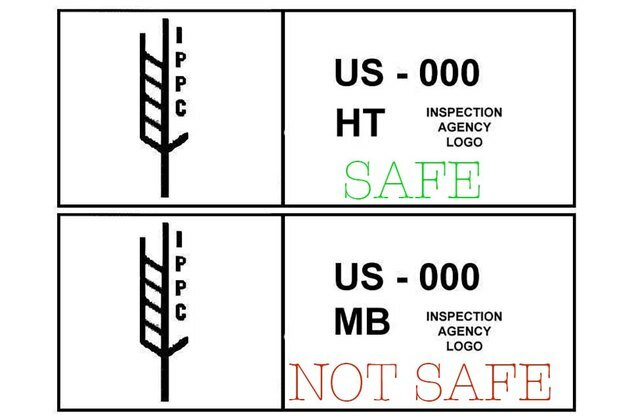 WARNING: Pallets that have the "HT" stamp (meaning heat-treated) are safe for indoor use. 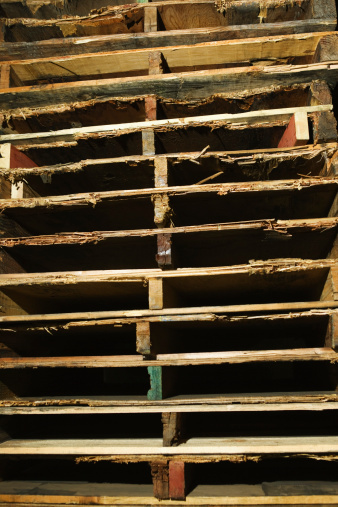 Pallets with the "MB" stamp on it have been treated with a chemical and are NOT safe for indoor use. 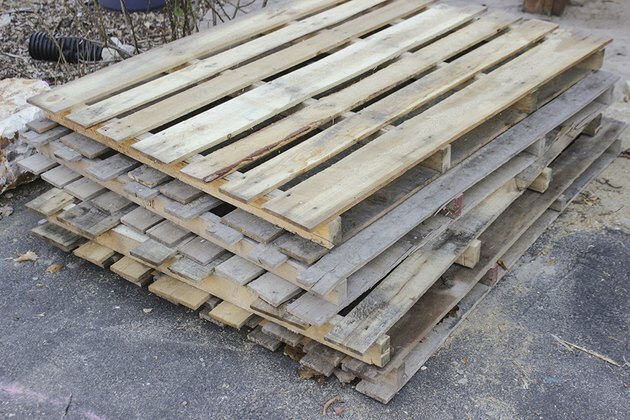 If the pallet has no stamp, verify its origin and use (making sure it wasn't used to ship chemicals, pesticides or other harmful materials that could harbor bacteria), before sanding and using indoors. TIP: A standard pallet plank is about 50 inches long. There are six to eight usable planks per side on a pallet, so a total of 48 to 64 linear feet of 1-inch-by-4 inch boards (approximately) . Determine how many pallets you need by multiplying the length of the accent wall by the width (to get the total area), and divide that number by the area that one pallet will take up (total linear feet x .3 feet (width of pallet boards). Using a reciprocating saw with a metal-cutting saw blade, cut through the nails that hold the pallet in place (four locations along one board). You will need to slide the blade between the pallet frame and the pallet plank where the nails attach, then turn on the saw to cut through. The saw should cut through the nails in about 30 seconds, so if it takes longer, then you are probably cutting at an angle and cutting wood. Readjust and make sure the blade is straight. Pallet wood is notoriously rough, so some sanding will likely be needed. Use 150-grit sandpaper with an orbital sander to sand the surface and edges so that splinters are gone and the surface is mostly smooth. Some texture showing grain and saw blades showcase the character of the wood, so lots of sanding isn't needed. 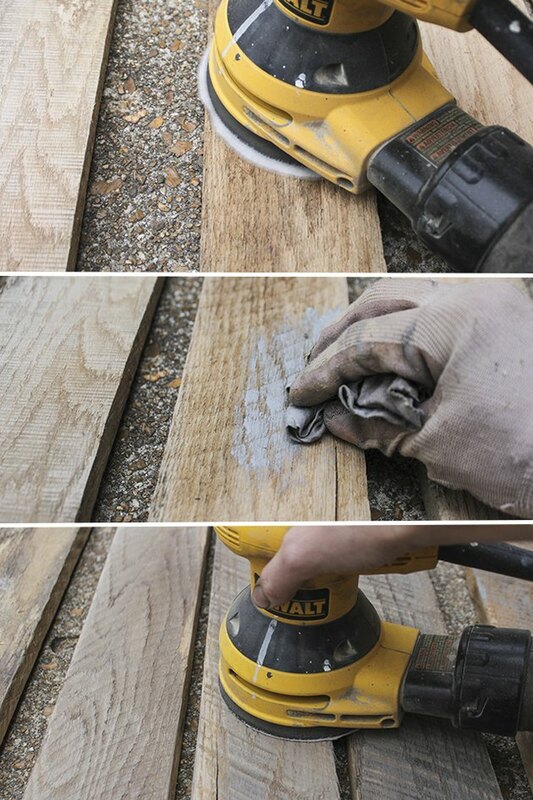 Since sanding the pallet planks can reveal "newer" or light-colored wood, you can lightly apply a weathered gray stain to the boards using a scrap rag and wearing gloves. 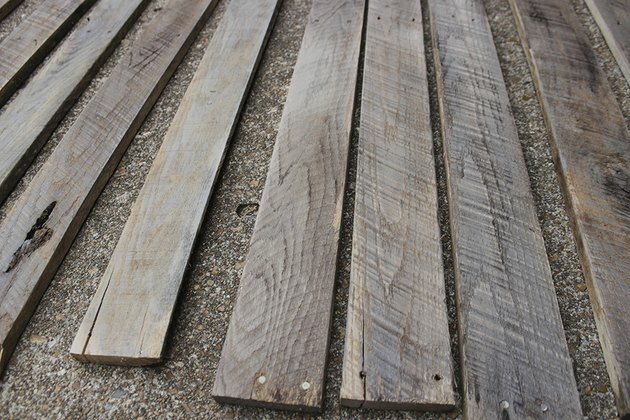 This gray stain will bring back the appearance of aged wood. Once the stain is dried, lightly and quickly sand the planks again to distress the wood and make it less noticeable where the stain was applied. 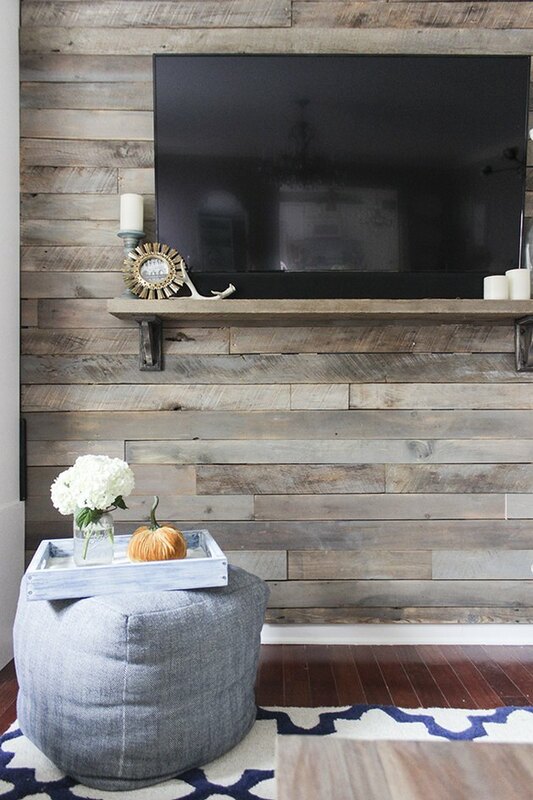 Pallet planks that are ready to attach to the wall should be dry and free of splinters and dust. Prep the wall where the pallet planks will be attached by removing everything on it. Pull away any furniture that is against the wall, so there is clearance for attaching the planks. If you plan to mount a TV on the wall, attach the mounting unit to the wall at the desired location. Using a stud-finder, mark where the studs are located on the wall. 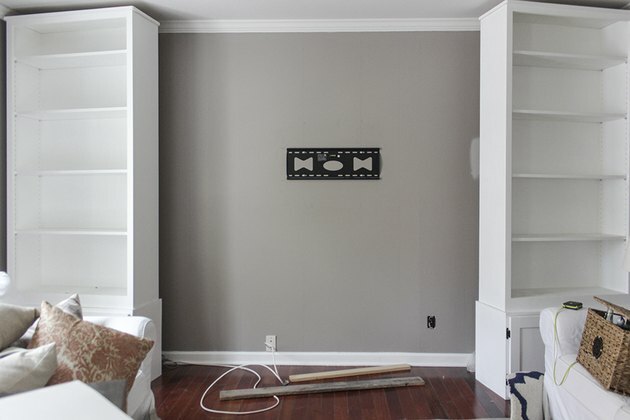 Use a circular saw or miter saw to cut the 1 x 3 boards to the height of the wall (subtracting the height of the baseboard trim and crown molding). 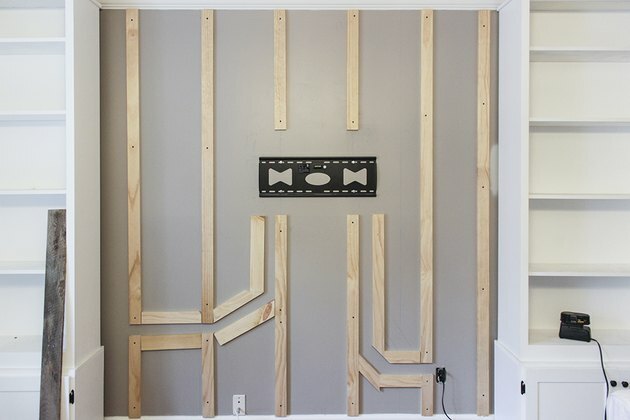 Attach the 1 x 3 boards, centered over the stud marks, using a cordless drill and 2 1/2-inch interior wood screws. About five screws per board is sufficient. If mounting a TV on the wall, to hide the cords (for internet, power, speakers, etc. ), you will need to create a pathway for the wires to follow behind the pallet planks. Cut small angled pieces of 1 x 3 board to create this pathway, making sure to not create 90-degree angle turns. A 30 to 45-degree angle turn will be easier for wires to follow, without getting caught. 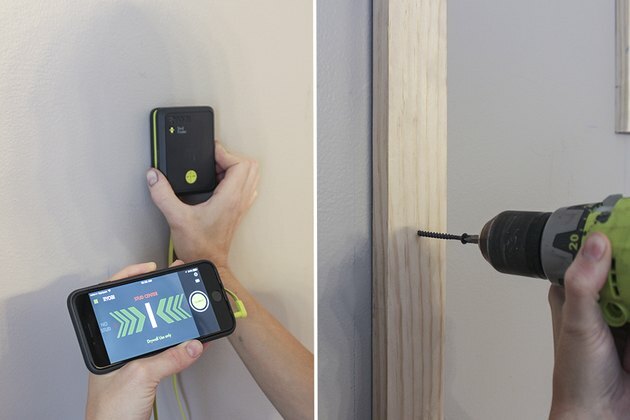 Attach these boards with 1 3/4-inch nails and a electric brad nailer into the drywall, nailing at a downward angle. 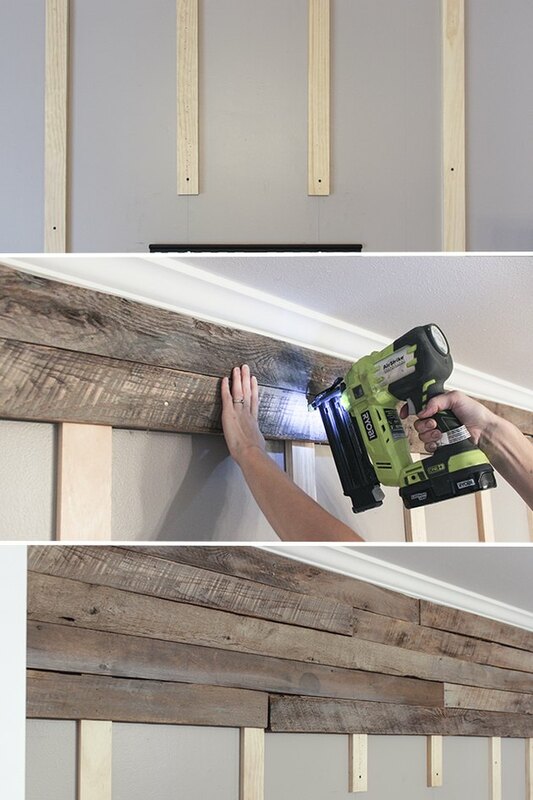 Once all the 1 x 3s are attached to the studs on the wall, begin to attach the pallet planks to the 1 x 3 boards by using 1 3/4-inch nails and the electric brad nailer. Make sure to stagger the planks as you attach each row. Try not to have two seams sit directly above each other in adjacent rows. 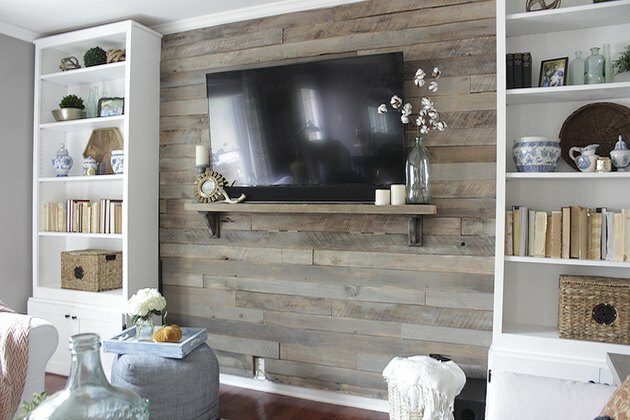 If a TV will be mounted on the pallet accent wall, measure around the back of the TV where the mounting hardware sits and mark adequate space on the wall around the mounting unit to ensure the TV has room to be mounted. TIP: If the TV mount has a tilt option, then you will need to run 1 x 3s behind the mounting unit. So instead of attaching the mounting unit directly to the studs in the drywall, it will attach to the 1 x 3 boards that are attached to the drywall and studs. Doing this increases the space between the TV and pallet planks so the TV can still tilt. 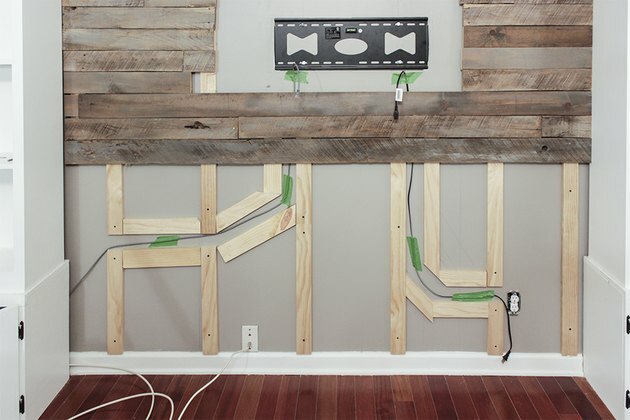 If a TV will be mounted on the wall, after the first few pallet planks are attached, run the wires through the pathways you created in step 5. Tape them temporarily in place, removing the tape just before you attach a plank over it. WARNING: When attaching pallet planks over the wires, be careful to not nail where the wires run. Pay close attention to where the gaps in the 1 x 3 stud boards are and do not nail in those areas, so as to avoid damaging the wires. TIP: To ensure that your wiring is up to electrical code, use a power management kit to run your TV cables and cords behind the pallet wall. There are many to choose from online, which are easy to install. 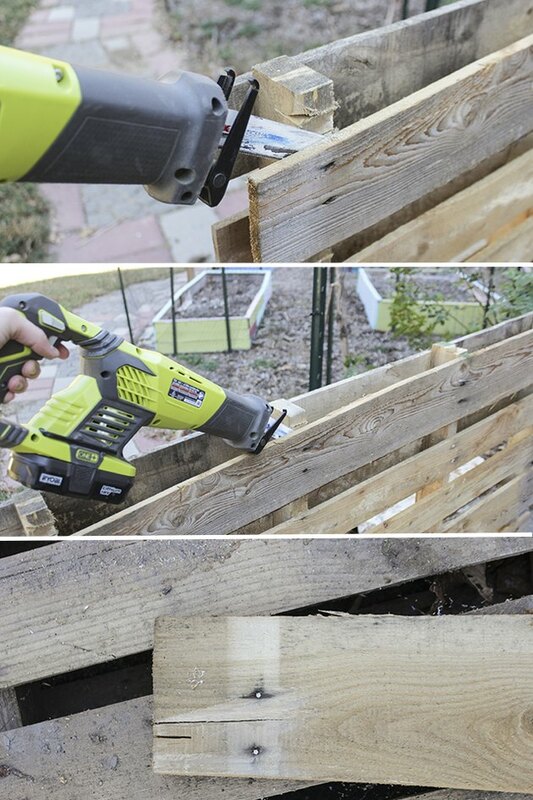 If a cut-out is needed in a pallet plank to make room for an outlet, measure the distance the outlet starts from the closest wall, the width of the outlet (allowing some clearance), and the height the cut-out needs to be. Be sure to account for the outlet and the coverplate, as the coverplate needs to be mounted flush on the drywall, not on the pallet wood. 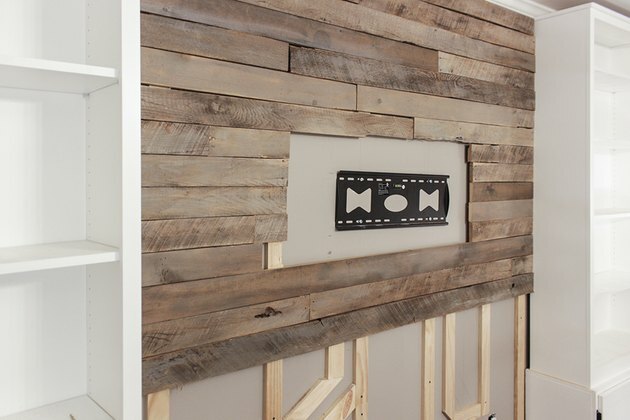 Mark these measurements on the pallet plank and cut out with a jigsaw before attaching to the wall. If mounting a TV on the wall, connect your wires first, then hang the TV on the mounting unit. 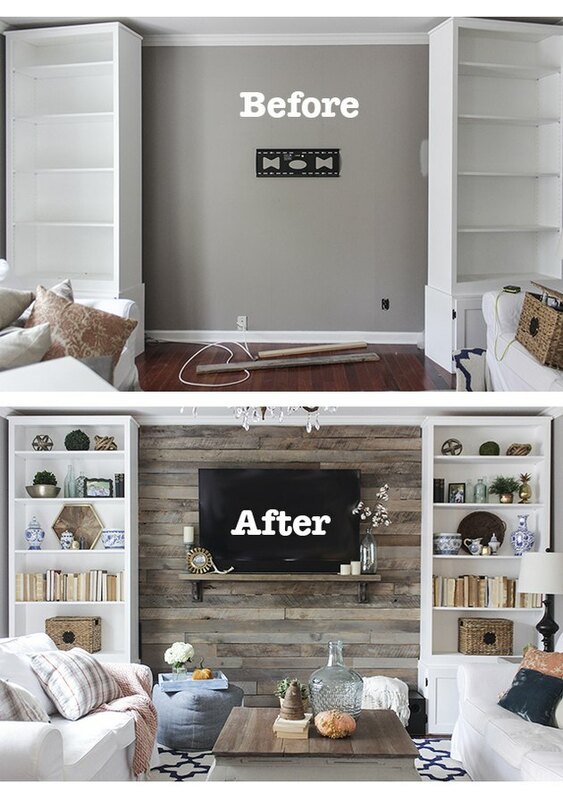 A simple shelf can be installed under the TV to hold a speaker and decorative items by screwing wooden brackets into the planks and setting a wooden board on top. Because the wooden planks are attached to studs, the brackets don't need to be attached to the same 1 x 3 studs under the planks. Re-hang any artwork, push furniture back into place, and enjoy decorating around your new accent wall.